The YotaPhone is a device that had an interesting concept right from the start: it was a traditional Android phone on the front, and on the back it had an eInk display to make reading easier and battery life better by limiting use of the traditional display (always the biggest battery killer). Unfortunately, limited availability has left the YotaPhone as a relative unknown, because despite an Indiegogo campaign, the YotaPhone 2 was never released in North America. 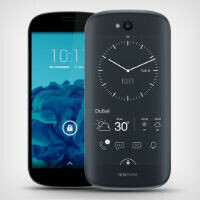 Yota wants to change that pattern with the launch of the YotaPhone 3, scheduled for release in Q1 of 2016. Russian Yota Devices has reportedly signed an agreement with China's ZTE for aid in "the production of new generation of YotaPhone smartphones, as well as the development and integration of mobile services and software." The initial production run of the YotaPhone 3 is only expected to be 100,000 units, but even at that level Yota appears to need the help. Unfortunately, there is no word on if distribution services are also part of the deal, but ZTE has proven it can produce quite a lot of devices. As of July, ZTE was the fifth best selling smartphone manufacturer in the world, behind only Samsung, Nokia, Apple, and LG; and, ZTE has a growing footprint in North America as well. The last question that needs to be sorted out is whether the YotaPhone 3 will continue using Android, or switch to Sailfish as rumors have suggested. i want them to get it right. i'd but this phone instantly if they do. Forget sailfish. I want one in w10! Been very interested in this. Sure doesn't seem like Yota will get it to every market, though. I guess there is something to say about a slow and steady business growth.